There is a certain small word that can not only change the intended or unintended meaning of a text, but also makes us girls totally freak out. This word is OKAY and its various forms as OK and the infamous and hated K. How is it that we have created such different meanings out of a word that simply expresses approval or acceptance? In reality OKAY, and both of its shorter versions, should all share the same meaning. However, us girls have taken it upon ourselves to create our own meanings, and yes I say us and our because we all know we have done it. So what do these tiny words mean now in a world of texting? OKAY and OK in my eyes personally mean the same. I don’t think anything different of the two. I myself always use the form OK. The only time this word would set off an alarm for me would be if the person I am texting usually uses the form OKAY and replied with an OK instead. Then I would know that something is up. The biggest culprit of this topic though is the single letter K. The subtext of this letter is significantly longer than the word itself, if you can even consider it a word. Guys use this as a response in two ways, both of which drive girls crazy and instantly make us snap. The first way that guys use this dumb little letter in a text is when they are being lazy. Yes why don’t you shorten an already short word. Do you guys realize how lazy that makes you look? If you are a frequent OK user this means that you literally cut a two letter word into a single digit. This does not do well on defending your literacy. The other way guys use this word is deliberately. Some of you know what this word does to us girls and that’s why you do it. It’s like lighting a fuse on dynamite. For the guys that are just lazy, you not only freak us out, but you are plain irritating. However for the those of you who use this word on purpose, you are cruel. 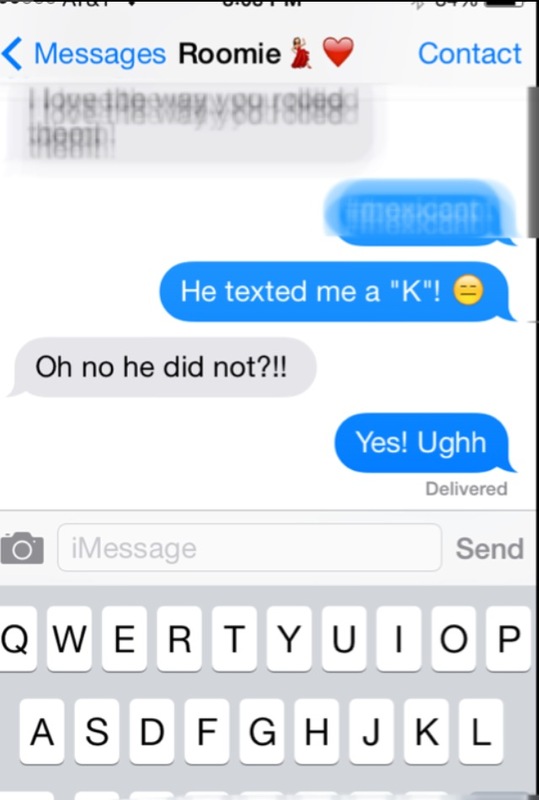 When we see this word K as a response it sends us girls over the edge. Why do we get this reaction from such a tiny word? It is because we have absolutely no idea what you’re are feeling in your response so the first feeling we jump to is anger. You write K and instantly we assume you’re mad. At first we are mad too just for the fact that you wrote it, but then we start to think. That’s the problem with girls’ minds, we over think everything. Then this leads back to my discussion about us girls turning psycho because of text messages we can’t understand. Now that you’re probably mad, because obviously are or you would have had the decency to send the O along with your K, we must now think back on everything that has happened since we last saw you and figure out what we did to make you upset. This task is not easy. A girl’s mind is like a microscope. If we are over analyzing the letter K just imagine everything else we over analyze. We will obsess over this letter until we know that you are not mad at us by either over nicely texting you showing you how not mad we are, going over to see you so that we can see with our own eyes that you are not mad, or doing the worst and asking you and starting a nothing argument. When girls find out that this response was out of shear laziness we have mixed emotions of anger and relief. Angry that we waisted so much energy and stress analyzing an imaginary situation, and relief that we did nothing wrong. But the guys that purposefully use this response as a weapon, girls go even more crazy over. This generally happens when you are already in an argument. What makes this worse is that the guy is actually mad and he knows the way to make you just as mad is to tell you K. This usually occurs when us girls are trying to make nice at the end of the fight. They know that you feel guilty and they prey on it to leave you cringing that he is still upset when he probably doesn’t even care anymore. Shame on you guys. The lesson here for everyone, guys and girls, is to just add an O whenever you feel like saying K. Bring some relief to everyone and spare a night of reliving the past couple days in hope that you don’t find anything that could have made the other mad. Okay? Ok.
Guys I’m curious to know how you feel when a girl responds K?